Overall print size: 30½" wide x 23½" high. Image Size: 24" wide x 16" high. 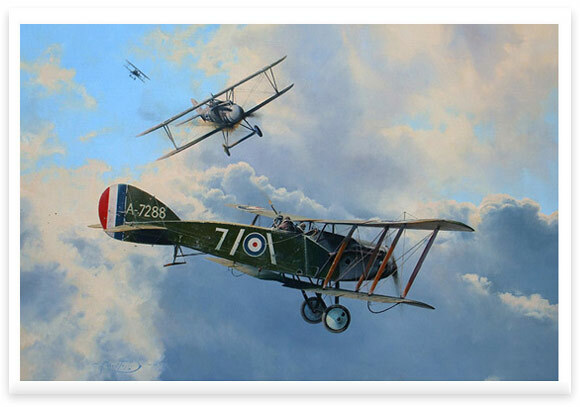 Robert Taylor’s new aerial masterwork captures perfectly the scenario on that decisive morning in November 1917. Lt. Powell is seen pumping a deadly burst of machine gun fire into a diving Albatross as the aerial duel wheels and turns in a magnificent skyscape high above Cambrai. Prints of this impressive new painting “The Biff Boys” are issued together with a matching-numbered companion drawing "Camels on Patrol", signed during his lifetime by famous First World War fighter pilot Henry Botterell. This is an outstanding opportunity for aviation art collectors to share a moment of air combat history that happened almost a century ago. The Artist Proofs and Tribute Proof Portfolio are now completely sold out.